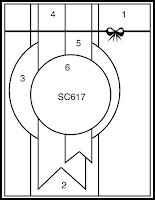 It’s time for the new SC617 Sketch at Splitcoaststampers’ and I am also incorporating the Splitcoaststampers’ F4A349 “Texturize” Challenge and the Retro Rubber Challenge Blog #rrbc50 “Fall Colors” Challenge. I have owned this ODBD Chickadee stamp for years (I have it as part of the ODBD retired stamp set, You Will Find Refuge (2010) but is still available as the ODBD Chickadee Single Stamp). Also, I just love the images in the ODBD Christmas Collection 2013 6x6 Paper and have been hoarding it (in fact, I have had this paper for several years and this is the first card I have created with the actual sheet that has the bird images- I told you, I have been hoarding it :-)). 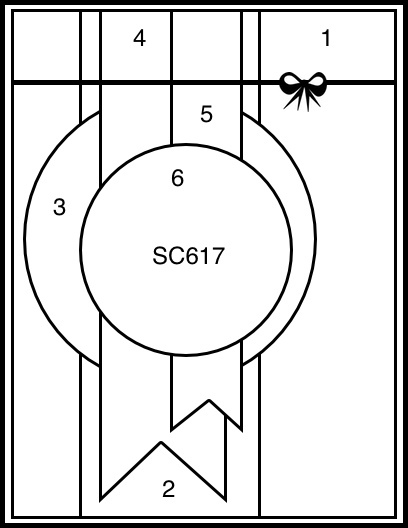 If you have not already visited the above challenge sites, I hope you will have a chance to do so- fabulous inspiration from my DT Sisters at the SCS Sketch Gallery as well as the Free for All Splitcoaststampers’ gallery and the gorgeous Retro Rubber Challenge Blog site! 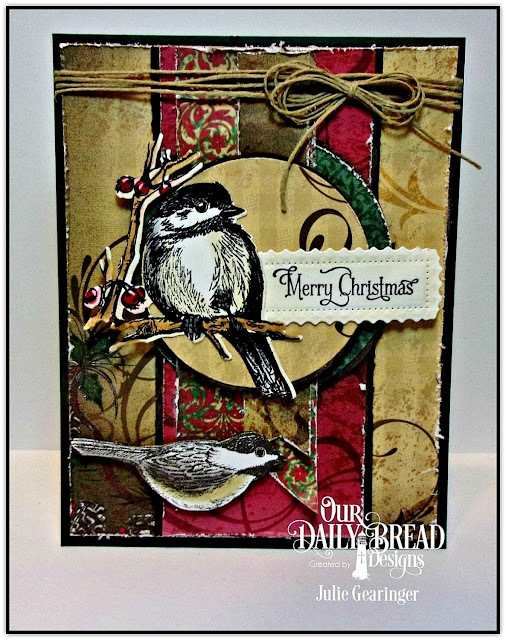 Ink the ODBD Chickadee Single Stamp image with archival black ink and stamp onto a piece of white cardstock. Color the chickadee using gray and saffron water based markers for the bird, cherry for the berries and vintage photo for the branches along with a water brush. 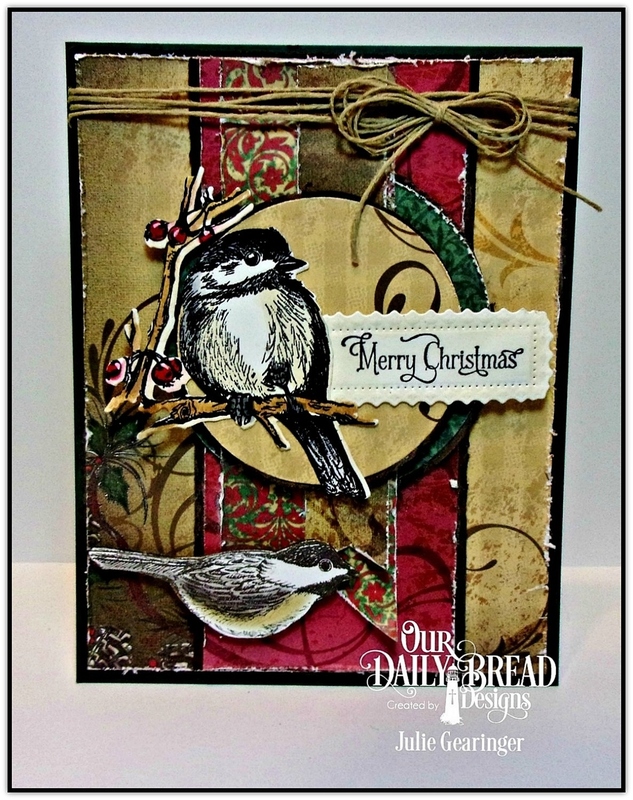 Die cut the image with the coordinating ODBD Chickadee die and set aside. Distress the piece of ODBD Christmas Collection 2013 background paper (fussy-cutting the chickadee from another sheet and layering onto espresso cardstock- also fussy-cutting around the edge), mount the distressed background panel onto espresso cardstock, trimming close to the stitching. Die cut two circles from espresso cardstock and various patterns of the ODBD Christmas Collection 2013 Paper using the ODBD Circle Dies, distress the edges and mount the designer paper circles onto split circles of the espresso cardstock (so only a small border appears). Create the banners by hand from the ODBD Christmas Collection 2013 Paper and layer the elements per the sketch layout (using dimensional foam for the smaller circle). Stamp the sentiment from the ODBD Christmas Note stamp set with archival black ink onto white cardstock, die cut and emboss with the ODBD Filigree Frames Dies and use a water brush to apply a light application of vintage photo distress ink. Layer the die cut chickadee with the sentiment (using dimensional to support the edges that are off the circle) and the fussy-cut chickadee from the designer paper (lining up the tail feathers). Add the strips of twine at the top before mounting the entire panel onto the hunter green card base. Mount the twine bow and add the white highlights to the berries with an extra fine white paint pen. I hope this card inspires you to create a project this week, and if so, come play along with us at Splitcoaststampers! Love the vintage look of this card, the colors and details are beautiful. Fabulous fussy cutting of the little Chickadees. Thank you for sharing with us at RETRO RUBBER! This is an amazing vintage card, Julie! So full of lovely textures and details. I particularly like chickadees also so this card was an instant hit with me. Thanks so much for sharing it with Retro Rubber fallish color challenge this week. Always love seeing your projects in our gallery!! So pretty, Julie! Your cards are always so full of wonderful details. The little chickadee is gorgeous! Thank you so much for playing along with Retro Rubber and hope to see you in our gallery again soon.